Whilst it provides a good overview it is interesting to do a little math. From the Verisign report Total Domains = 138 million, Total ccTLDs = 51.5 million which gives 86.5 million gTLD domains. All well and good but where are those 86.5 million gTLD domains registered? Vint Cerf predicts the end of TV as we know it. “Talking at the MediaGuardian Edinburgh International Television Festival, Vint Cerf – one of the handful of researchers who helped build the internet in the 1970s – said that the television industry would change rapidly as it approached its “iPod moment”. NeuStar, Inc. has announced it has deployed internationalized domain names (IDNs) for the Korean language in the .BIZ top-level Internet domain as of August 19, 2007. .BIZ IDNs in are now available in Korean, Chinese, Danish, German, Icelandic, Japanese, Norwegian, Spanish, and Swedish. “YouTube will introduce advertising into video clips today for the first time as the world’s most popular video- sharing website tries to justify its $1.65 billion (£832 million) purchase price. “Twenty seconds after a clip begins, a transparent advert appears in the bottom fifth of the video for a further 15 seconds. Clicking on the image overlay plays the advert, but if ignored it simply disappears. Google has announced new functionality for Google Maps – Emdedded maps, which allows blogs and websites to embed the funcionality of Google Maps by simply copying a snippet of html in the same way YouTube does for videos. “Audible.com was founded an eternity ago, in 1995, and is one of a handful of internet dotcoms to go public during the first bubble, and yet survive. “I started the business too early,” he jokes now. US advertising revenue at 4 big online media companies–Google, Yahoo, AOL, and MSN- grew by $1.3 billion in Q2, or 42%. US advertising revenue at 15 big television, newspaper, magazine, radio, and outdoor companies (Time Warner, Viacom, CBS, News Corp., CBS Radio, Citadel, Disney, Entercom, Clear Channel, Clear Channel Outdoor, Time Inc., New York Times Company, McClatchy, Dow Jones, and Gannett) shrank by $280 million in Q2, or 3%. The New York Times has an article looking into the marketing campaign for TIAA-CREF. “A LARGE marketer of financial services is seeking to become the master of a domain name. “TIAA-CREF’s “Manifesto” Ad The marketer is TIAA-CREF, which is making a significant change in its advertising that plays up its status as a nonprofit organization. The campaign, getting under way this week, signals its intent by focusing on a new Web site, powerof.org. 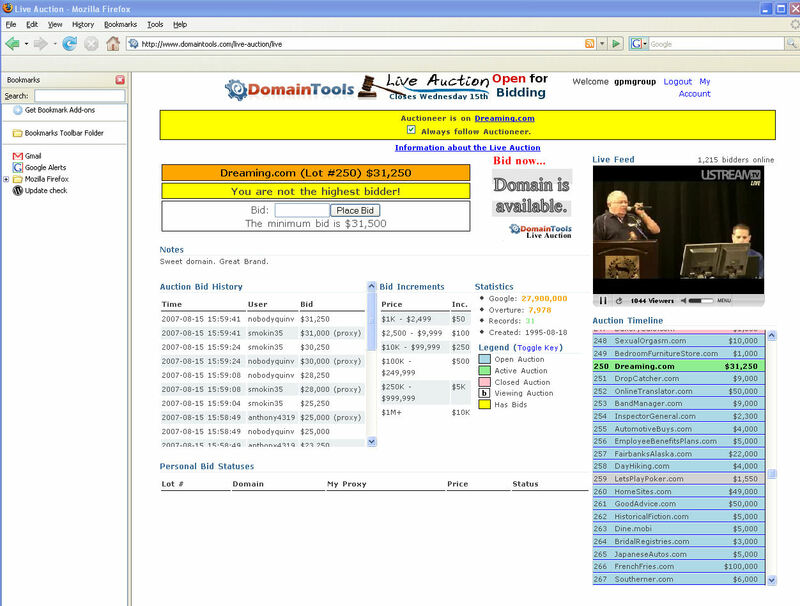 The auction allowed people at the venue and anyone online to bid real time while also providing high quality and stable video and sound feeds of the auction room. The staff did an excellent job of keeping up with the auctioneer and the bids from bidders both online and in the room. This meant all the information needed to bid was displayed on a single web page anywhere in the world making it almost as good as being in the auction room and without the cost of getting there. Other improvements on other auctions included no fee for absentee bidding and the first bid met the reserve, which moved the auction along much quicker and removed the worries of people bidding to just below the reserve to promote their names.